A native of Pobè in Benin, Marcel Alain de Souza took office as the new President of the ECOWAS Commission on 8 April 2016, succeeding Kadré Désiré Ouédraogo of Burkina Faso. Benin was designated to chair the Commission at the Conference of Heads of State and Government of ECOWAS on 17 December 2015. Marcel Alain de Souza holds a master's in economics from the University of Dakar and a post-graduate degree in administration and banking from the West African Training Centre for Banking Studies; he completed his economics training at the IMF Institute in Washington. 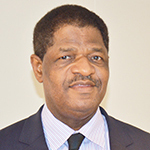 De Souza spent much of his career at BCEAO, where he gradually rose through the ranks, from a position as an internal auditor in the Cotonou office to that of national director for Benin then director of administration at the Bank's headquarters in Dakar. In 2011 he was appointed Minister of Development, Economic Analysis and Forecast in the government of President Thomas Boni Yayi. An independent candidate in the 2016 presidential election, de Souza was appointed on 22 March by the outgoing president to take the reins of the ECOWAS Commission. Marcel Alain de Souza is the fourth President of the Commission and the first of Beninese nationality since the Commission was instituted in 2006, replacing the Secretariat. Bearing the "ECOWAS Taxi" initiative, he intends to make the free movement of people and goods a priority of his mandate.